With the quick advances of their mechanized Blitzkrieg tactics, vehicles were needed to move the German army commanders and generals from place to place as their army pushes forward. One such vehicle was a 4-door version of the Austrian Steyr 1500A/01 light truck, which was powered by an 85hp 8-cylinder engine and had good cross-country performance. As this was a commander's vehicle, modifications included a more spacious 5-person cabin as opposed to the truck's 8-person capacity. The cabin was also fitted with leather seats and a front passenger seat that could recline to form a bed. High-level German commanders on all fronts used them as their personal vehicles. 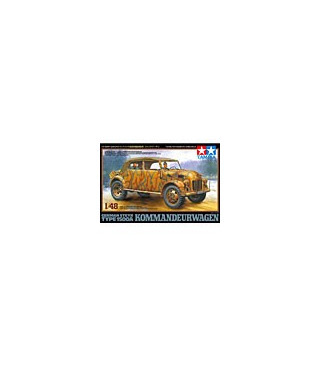 * 1/48 scale assembly model kit of the Kommandeurwagen German Steyr Type 1500A. * Distinctive shape of the engine hood and rear cargo compartment accurately reproduced. * Doors may be modelled in both open and closed positions for increased display possibilities. * Parts are included to depict the vehicle with canvas top in either up or down positions. Clear parts are also included for the windshield and side windows. * Die-cast chassis provides added weight for a more realistic sense of volume. * Extra body accessories such as insignia flags and jerry cans enhance realism. * Kit comes with 2 figures, 1 driver and 1 commanders, in life-like poses. * Also comes with 3 types of markings.